A Ph.D. Candidate at the Polish National Film School, Joanne-Aska Popinska immigrated to Canada to pursue filmmaking and activism. 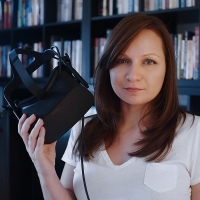 She is the co-founder of Tribe of Pan, an Immersive Media Studio based in Toronto, Canada. Former Artistic Director of the 3D IMAGE Film Festival in Lodz, Poland, she is at the forefront of the bleeding edge of cinema and technology. As a documentary filmmaker, Joanne-Aska dedicates her creative vision to share some important messages about the issues that one often quickly "scrolls through": human rights, animals rights, environment. By using the newest technology and various narrative techniques, she searches for the ways to make the audience care, even if they thought they were not yet ready to listen. She is currently producing and directing The Choice VR, an innovative volumetric documentary project.